Research has found that ketogenic diets have been formally prescribed to treat epilepsy since before 500 B.C. In the 1920s, they were adopted by Johns Hopkins Medical Center as a means of treating epileptic children, and have been used there ever since. In recent years, ketogenic diets have been investigated for their potential in treating several diseases. Check out this article to see if this diet is right for you. What Fast Food Lunch Can I Eat While Keto? 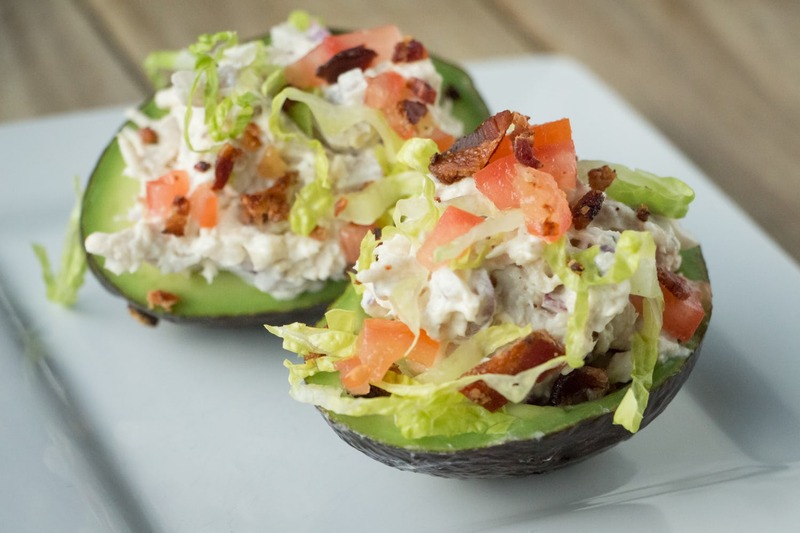 To learn about more ways you can eat while following a Ketogenic diet, check out our Keto Diet Guide to Restaurants, Fast Food, and Takeout HERE. Slice the onion. When caramelizing onions, you want to slice against the grain, so chop off each end (the bud and the root), then lay the onion on one of the flat surfaces. Slice onion in half through the core. Lay flat again, and starting at the root end, slice against the grain. Chop asparagus and sausages into 1” bite-size pieces. In a medium saute pan over medium heat, add the chopped sausage. Once the edges begin to brown, add the onion and 1 tbsp. of butter. Turn down to medium-low heat. Once the onions soften and begin to caramelize, add in the asparagus. Saute for another 5 minutes, and set aside. Grease sheet pan with raised edges using remaining butter. In a large mixing bowl, whisk the eggs, heavy cream, and season with salt and pepper. 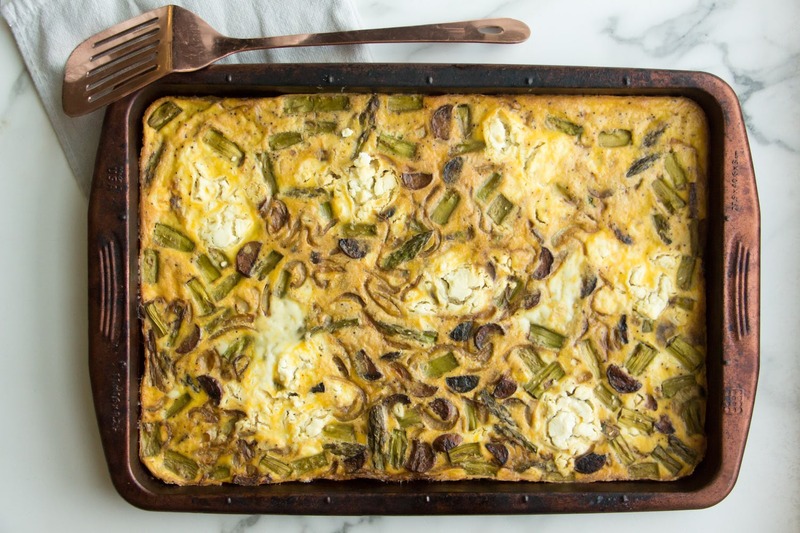 Add sauteed sausage, onions and asparagus to the sheet pan. Top with egg mixture. Dot with cheese evenly. Bake for 15-20 minutes. Cut into squares. ● Toss arugula in lemon juice and olive oil. Serve salad and sliced avocado on top of two egg squares. ● If you’re not following a strict ketogenic diet, you can cut the eggs into perfect-sized squares to fit a breakfast sandwich. ● Slice and store in an air-sealed container for up to three 3 days in the fridge. In a mixing bowl, add shredded chicken, mayonnaise, diced red onion, rendered bacon fat, and spices. Mix to combine.
. Slice the avocados in half. Carefully remove the pits and discard. Scoop out about 1 tbsp. of avocado meat (then eat it as a pre-meal snack). Add chicken salad in each of the 4 halves. Crumble bacon on top of chicken salad, then sprinkle diced tomato and lettuce on top. Serve with a spoon. *Brazil nuts and macadamia nuts are higher in fat, lower in carbohydrates compared to other nuts making them ideal for the ketogenic diet. **You can use raw garlic instead, but roasted garlic adds an extra complexity of flavor–in other words, it’s good! 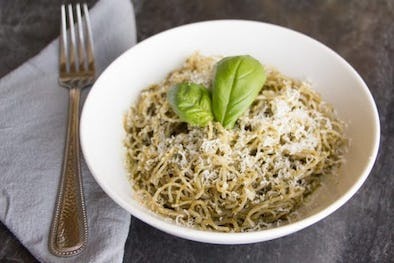 Add basil, nuts, garlic, Parmigiano Reggiano, juice from the lemon, salt and pepper to a food processor or high-powered blender. Pulse until smooth. Slowly add EVOO to the processor and continue blending. Pick the largest, most sturdy pieces. 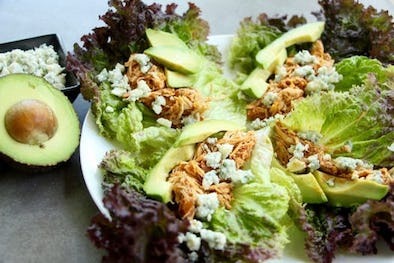 Add about ¼ cup of the shredded chicken, 2-3 slices of avocado, and a sprinkle of blue cheese on top of the lettuce. Squeeze fresh lemon juice on top of the avocado slices to prevent browning. Enjoy! For the kelp noodles, simply rinse. They’re naturally a bit crunchy, but if you prefer them softer, you can boil in water for 10-20 minutes until desired consistency is achieved. Toss in with the pesto. Serve with a nice, fatty piece of fish or steak. Wash and pat dry the head of lettuce. First, mix the dry ingredients in a large bowl. You might need to break up chunks of flour with a fork. In a different bowl, add the wet ingredients except for the ricotta cheese. Mix until combined. Pour the wet ingredients into the dry ingredients, and mix with a silicone spatula. Fold in the ricotta cheese. Grease mold of choice. I used a standard muffin tin, but a biscuit mold would be even better! You want to opt for a higher smoke point fat or oil when baking at 400 degrees. I recommend a little grass-fed butter, rendered bacon fat, or avocado oil. If you use a biscuit mold, this will make about 7 biscuits verses about 12 muffin-size biscuits. Spoon mixture into mold, and flatten the tops. This is completely optional, but for a more crisp top, coat each with an egg wash. (Whisk an egg in a small bowl, and brush over the flat tops of each mixture). Place the tin or molds into the over and bake for 20 to 22 minutes. Biscuit molds may bake for a little longer. They’re done when the tops are a nice golden brown. 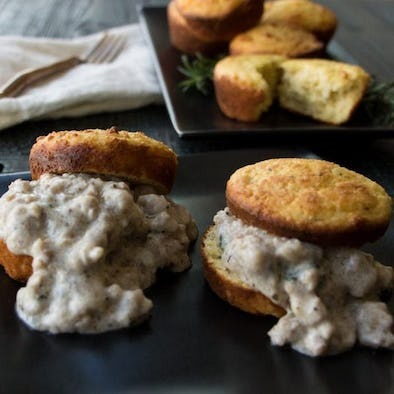 While the biscuits are cooking, make the sausage gravy. See recipe below. Remove from oven. Enjoy warm! *If you aren’t following a strict ketogenic diet, you can substitute the sour cream with a whole-fat Greek or Skyr plain yogurt instead. Basically, anything high in carbs—no matter how nutritious it is otherwise—should be minimized or banned from your kitchen. 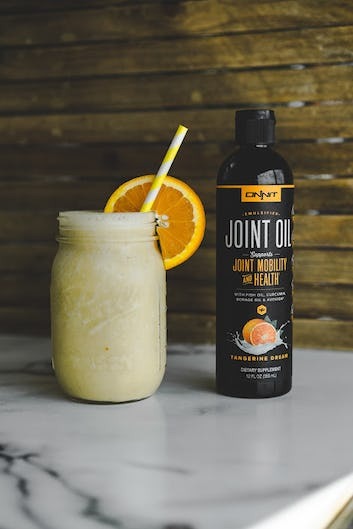 This encompasses soda, fruit juice, smoothies, pastries, candy, and desserts, as well as some condiments like ketchup and barbecue sauce. No smart diet allows you to booze, but in addition to the problematic effects of alcohol by itself, most drinks contain sugar. However, the occasional small serving of dry red wine may not kick you out of ketosis or otherwise spoil your fat-burning efforts. Crackers, chips, or any snacks labeled as “low-fat,” no matter what other nutritional benefits they may claim. Also included here: foods that contain sugar alcohols (such as sorbitol or xylitol). These are common in “sugar-free” foods and may negatively affect ketone levels. The sugar content is too great. However, small amounts of berries are low in sugar, and can be part of a ketogenic diet. Oats, corn, rice, pasta, bread, and other wheat-based products. See “Are There Any Other Exceptions To The Rules?” below. Peas, lentils, kidney beans, garbanzos, etc. Again, see our section on exceptions. Mayonnaise, soybean oil, canola oil, and other vegetable oils. 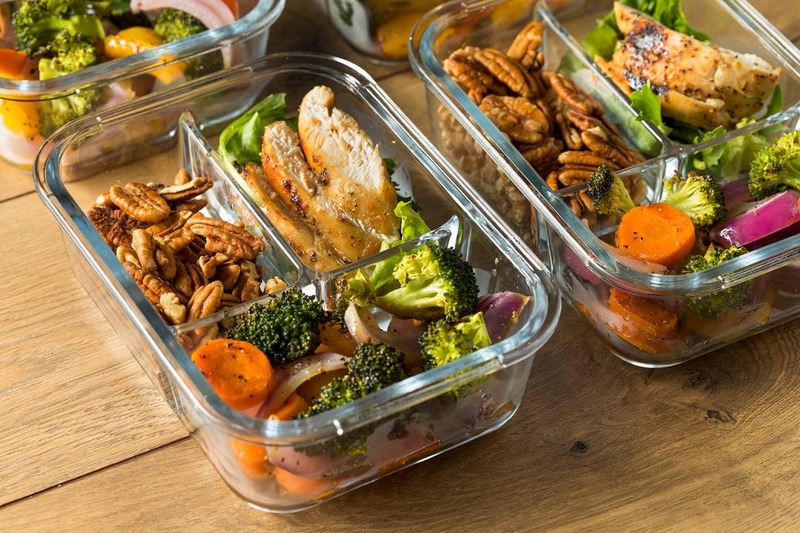 Where can we get those glass meal prep containers though.